I've been feeling a little sensitive since being called a hoarder, so I have been cleaning and organizing like crazy! 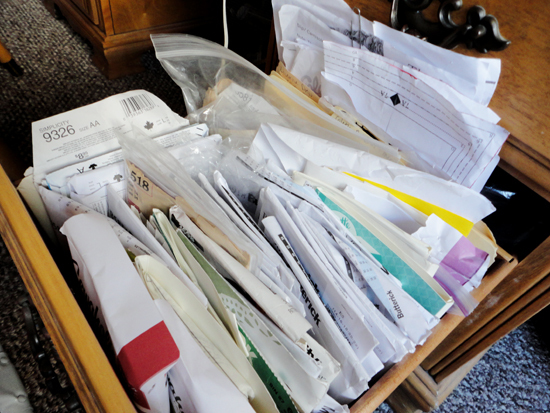 One area I had to conquer was my desk drawer that holds all of my patterns. Clearly, I wasn't storing my patterns properly or effectively. Totally an embarrassing photo, but I'm not going to lie to you guys! Last week I went to the store and bought four plastic bins. Just on a random note, growing up I worked in a deli and these bins were used to store cheese, so I think of them as cheese bins :) When they're not storing cheese they are perfect for holding patterns and I had a spare shelf to hold all four. 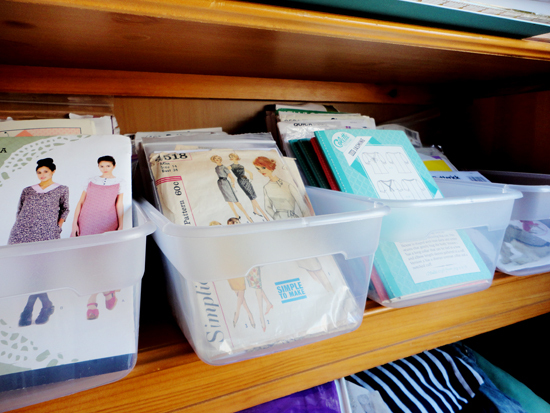 I organized my patterns into four groups (left to right): modern dress patterns, vintage or vintage reproduction patterns, separates, and random stuff (dog coats, bags, etc). Doing this clean up forced me to take a closer look at my patterns, which was good. 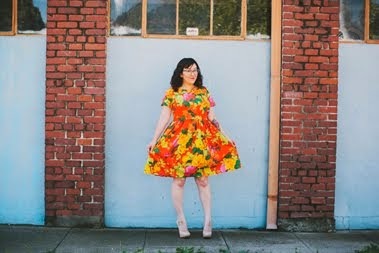 It is now very clear to me that I have lots of dress patterns, which isn't the most practical because I don't wear dresses on a regular basis. One of my goals will be to make more separates. Sorting through patterns forced me to get rid of the ones I didn't even want. You guys know how it is, people will give you stuff "because you sew" and sometimes you don't even really want it. The 90s patterns that I was "gifted" went to the thrift store. Trust me, if there were any cool ones you know that I would give them to you guys!! 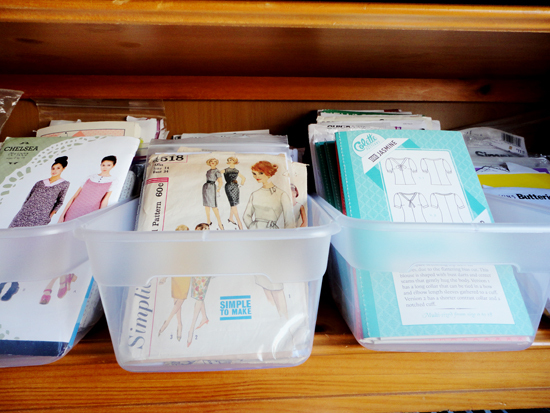 How often do you go through your patterns and organize? Hopefully this system will last me for a while. I use the 16 gallon bins because I can close the lid if I turn the patterns on their sides. Important because my sewing area is in our basement. For bigger patterns like Vogue, I use a bigger bin. I really need a pattern storage system. Mine is abysmal, they're all over the place! I kept putting it off, but I'm glad that I did it! I also use the manilla folders for the random patters. My desk drawer (the overflowing one in the photo above) fits the file folders perfectly! When I was at JoAnns the dog coat pattern was on sale for $1. I would like to make her something... but you know how that goes! I just organized my patterns a couple weeks ago. I bought some plastic bins with lids to store them in. I so wish I had a space to set mine out like this. Go Shanni! Doesn't it feel so good to be so clean and organized? 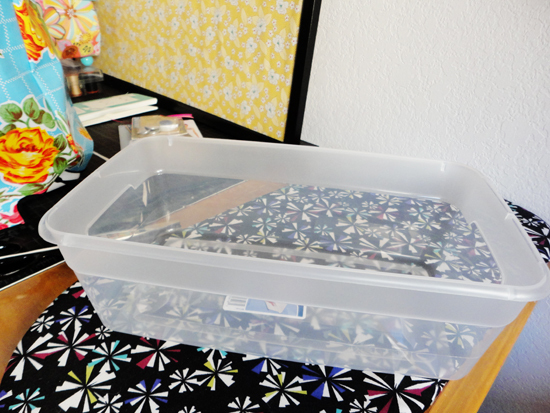 I use those same plastic bins for my patterns too! And ahhh, I definitely have WAY too many. Organizing them by type helped. I keep acquiring more, though. I can't help it - they are just so beautiful, and who else is going to save & protect them from the dump?? Ahhh!! Ohh I know the felling. I spent the weekend organising my sewing stuff and I got so much repeated gadgets and equip, patterns with similar design.. I'm de cluttering too and it feels great. Yeah I'm feeling a little guilty for picking up those vintage patterns this weekend because my current pattern stash is in a similar state lol! I like your "cheese bins" because they're clear. Mine are in those fabric cubby hole bin things so they're easily forgotten. I should go through all my patterns too! p.s. you're totally not a hoarder! I'm inspired by your bins! My patterns are a mess too, I really should get them in better order. Oh, you're so nice and neat! Love it! I need to get organized-- my patterns are all jammed into a dresser drawer, but there really isn't enough room for them and it's a total mess! Thanks for the push to clean up my own pattern storage. I will be posting some of my progress tomorrow. Hope you don't mind, I linked to your blog on my post today. Have a great day!